Spelling You See takes an unique approach to teaching spelling to learners. Currently, there are seven levels to the program, we reviewed Level G- Modern Milestones. 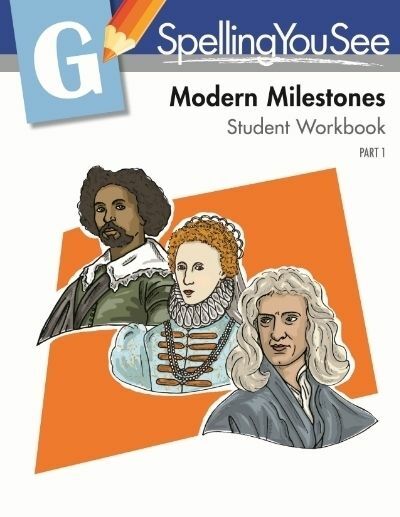 Modern Milestones comes with two student books, an instructor's handbook, and Crayola erasable colored pencils. The program is leveled by letters rather than grades which limits the idea of restricting the student to a particular grade level. The reading level does matter when selecting a level because the student is required to read each week's passage aloud each day. There is an assessment on the site to help you choose the best level for your child. Spelling You See does not only teaches spelling, but also incorporates reading and handwriting. What I found unique about the program was the mesh of the weekly words into a historical passage. If your child is enjoys history, this program may be a good fit because it draws the reader in with engaging stories versus solely a list of unrelated words. The colored pencils were also a pleasant surprise. I didn't know their purpose originally, but my daughter was thrilled to find them in the bundle. The goal of the program is not to just teach a list of words, but to help the child understand the foundation of a given word. Spelling You See accomplishes this by not only providing the child with a selection of words, but also having the student look for different parts of a word. This is where the colored pencils come in to use. For example, my daughter would underline suffixes of all words with suffixes yellow. The base words were underlined blue. Marking the words is a requirement for each day. This process helped my daughter visualize the spelling of the words, and how each part of the word fit together to create the whole word. The program does teach rules using a nonthreatening approach by offering short explanations of the spelling rules before each lesson. These notes are written to the student. The core of the program is copy work and dictation. There are five days of activities with copy work and dictation taking place on four of those days. We had to get use to this because we do not practice dictation and copy work often. This also caused my daughter who is ten to adapt to writing more than a few sentences. This was basically her only challenge. For those who struggle with writing, the program suggests limiting the writing time to no more than ten minutes. She usually completed writing each passage in about seven minutes so we learned the amount of time wasn't the problem. Overall, the program is well-thought out, and has a solid approach to teach spelling techniques. My daughter enjoys history therefore the passages held her attention. The program encourages reading aloud which caused me to listen to her read daily. My daughter is a natural speller, but less used and longer words are not always spelled correctly. I did notice that there was improvement in this area. Her last dictation she only misspelled one word, and it was not a word of the focus words. We will continue using Modern Milestones.